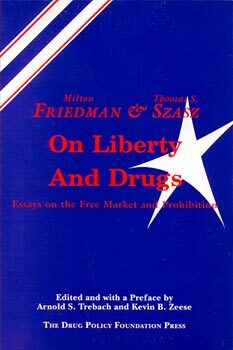 In this unique anthology, Professor Milton Friedman and Dr. Thomas Szasz advance parallel arguments for ending the war on drugs by returning to the free market controls of the nineteenth century. Both renowned scholars argue that the drug war is not only harmful to a free society, but it is also morally wrong in any society. The case for prohibiting drugs is exactly as strong and as weak as the case for prohibiting people from overeating. If it's in principle OK for the government to say you must not consume drugs because they'lll do you harm, why isn't it all right to say you must not eat too much because you'll do harm.? "I favor free trade in drugs for the same reason the Founding Fathers favored free trade in ideas: in a free society it is none of the government's business what ideas a man puts into his mind; likewise, it should be none of its business what drugs he puts into his body."